A four-month agricultural training program at ICRISAT headquarters has proved to be a game-changer for unemployed youth from South Africa. The students completed their training in early 2016 and the results are now beginning to show. 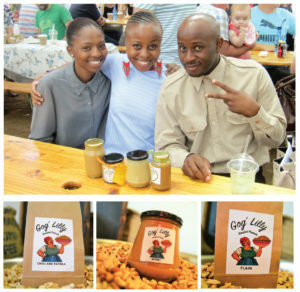 This group has come up with the ‘Gog’ Lilly’ brand of peanut-based products – different varieties of peanut butter and roasted peanuts – which have already entered the local market and aspire to make it to international markets. 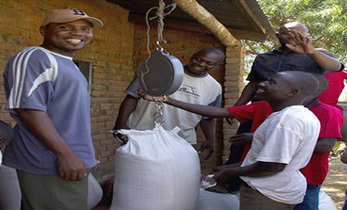 The work of these young farmers encompasses the whole peanut value chain from growing, processing and marketing. 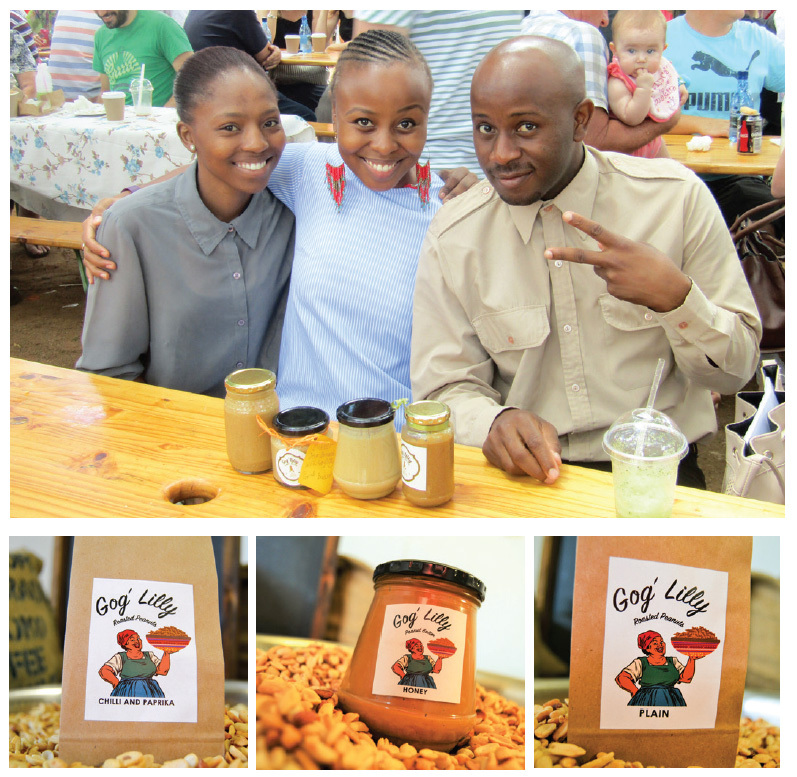 Mr Karabo Mphaphuli, who interned with the Agribusiness Innovation Platform (AIP), ICRISAT, is the founder of Gog’ Lilly. He is also an aspiring seed producer and is in the process of establishing the Bontle Le Temo village seed bank. Mr Mphaphuli participates actively in various youth forums. He was the runner-up at the 4thAnnual Green Youth INDABA 2017, Johannesburg, South Africa which focused on the theme ‘Promoting Green Innovations and Sustainable Skills development for inclusive Growth’. Ms Pretty Aphane (extreme left) interned with the ICRISAT Development Center and was trained on marketing of confectionery peanuts. She is responsible for the marketing of Gog’ Lilly products. Sitting beside her is Ms Mbali Zondo, a PR Manager at Hauwai Cellphones, who volunteered to assist with developing the Gog’ Lilly brand logo. The group came up with the name Gog’ Lilly because most wisdom is shared by grandmothers (Gogo), and yet they are the least celebrated people in our communities. Mr Page Baloyi (extreme right) interned at AIP, ICRISAT. 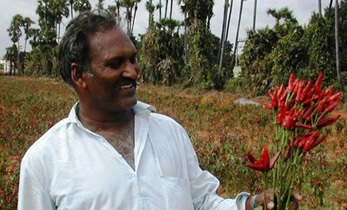 He was trained on business incubation and is now responsible for the sales of Gog’ Lilly products. The group says that another significant takeaway from their training at ICRISAT is ‘Knowledge Sharing’. 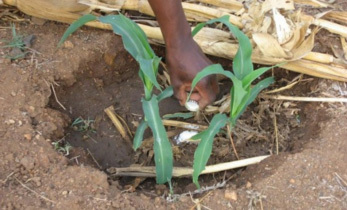 “We have started sharing what we learnt with 15 local farmers. 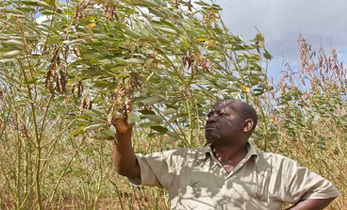 These farmers will source the seed from us to grow peanuts”. 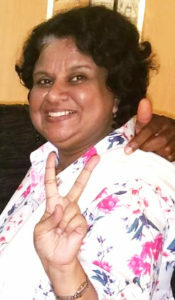 Ms Vidya Bhandarker, who envisioned building an academic bridge between ICRISAT and South Africa’s underprivileged youth for agri-preneurship development, writes to Dr David Bergvinson, Director General, ICRISAT, acknowledging how the intellectual and scientific capital provided by ICRISAT to six South African interns ‘free of cost’ resulted in the Gog’Lilly brand of confectionery peanuts and peanut butter finding its way to the market in a span of 18 months. I am deeply grateful for the opportunity you gave six poor matriculates from South Africa to train at ICRISAT and become agri-preneurs. I still remember the first meeting at ICRISAT and yes I was so hoping you would agree to my proposal of bringing them to ICRISAT. 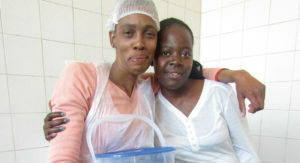 You have in just that one action changed their lives around in ways that are miraculous. My belief that only ICRISAT can do this has come true. Their experience at ICRISAT was cathartic. They were awestruck you spent time with them over Christmas and New Year 2015. They were talking about how accessible all the important people and scientists were to them, and how this reinforced their belief about the transformational potential of agriculture to improve lives. 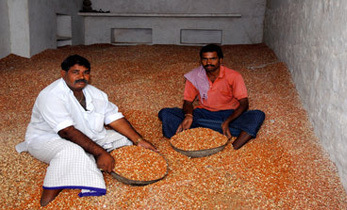 They went back committed to working hard on a meager stipend and today have become proud farmers, and harvested two tons of peanuts. 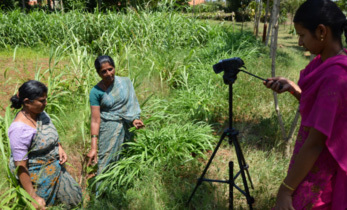 I do hope ICRISAT will reconnect with them, and support their ongoing efforts. Sometimes they just don’t have enough cash for mobile data to connect, they will be happy to hear from ICRISAT. 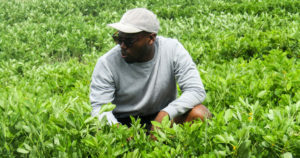 Their success story is playing out in drought-stricken, under-privileged parts of South Africa, they would welcome a visit to show how they overcame odds and are making sustainable food production a reality. My dream of forming a bridge between South Africa and India has literally taken root in this partnership catalyzed by ICRISAT, thank you. I am sure I speak on behalf of all six interns to say that our sense of gratitude is profound.